Just about everyone who’s spent much time outdoors in warm weather has encountered those pesky critters that seem to want nothing but to eat you alive! Ouch, something bit me! Well, it was just such an incident that inspired the poem that we’re making into a children’s book - with your help! I was outside mowing the lawn in early summer, and before I knew it, I’d been chosen by the local crew of mosquitoes as their lunch! 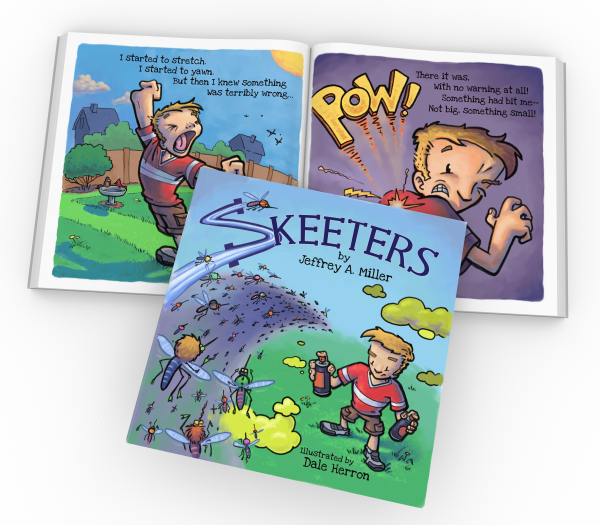 “Those skeeters are eaters!”, I thought. “Hey, wait a minute! I should do something with that.” That bit of a rhyme grew into a whimsical expression of the age-old conflict between man and mosquito. Friends and family listened to their great delight, but I never dreamed that it would be much more than a fun story at parties. Years later, when I met Brandy, I shared the poem with her, and she loved it too! Brandy insisted that it should one day become a children’s book. Guess what? She was right! Now we’ve taken that step. 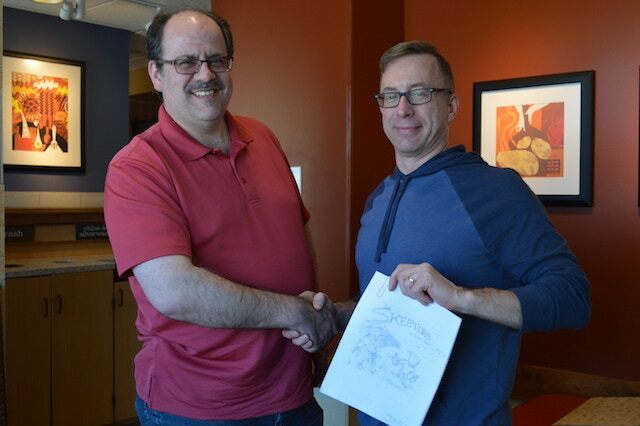 We partnered with a talented illustrator, Dale Herron (daleherron.com), to create the artwork for this fun story. 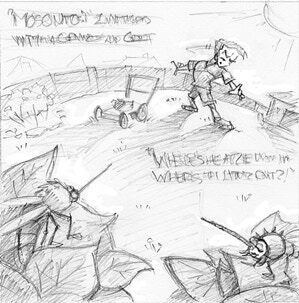 He’s turned our concept and story into an amazing book with images that bring the mosquitoes to life. We’ve even named the main characters, and Dale’s illustrations make their personality come through in the story. My wife Brandy and I have chosen to grow our family through adoption. Adoption can be an expensive undertaking. Many families have room in their heart for an adopted child, but the financial cost keeps them from fulfilling that desire. A portion of the proceeds from sales of the book will be dedicated to support future adoptive families in their efforts. We’ve created a book we know you’ll love. 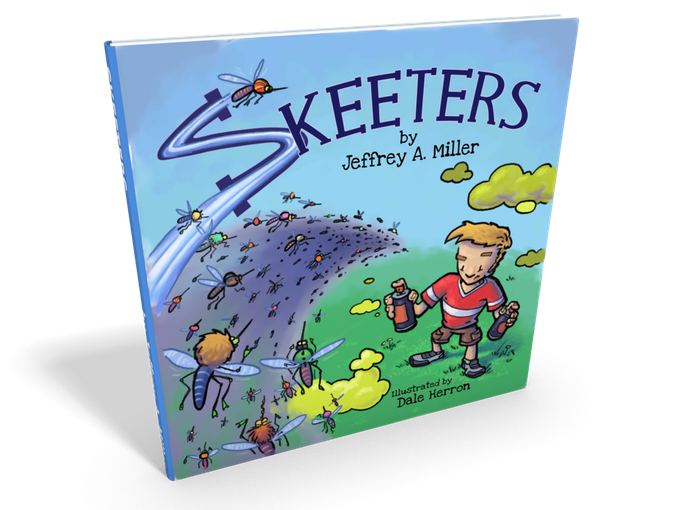 An 8” x 8” book with beautifully illustrated story and character pages tells a story that will make you smile, as you listen to the tension mount between Wendell and the mosquitoes! 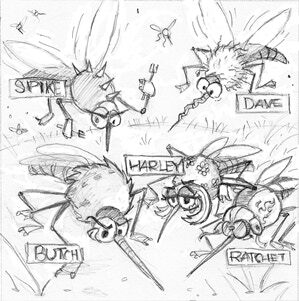 In addition to the story, you’ll enjoy a special full-color character gallery page introducing each mosquito by name. Our adoption adventure is just starting to pick up steam, and the process can be very unpredictable. We can’t guess what’s right around the corner as we take this step, but we know that your support will play a significant part in the joy of the experience! © 2018 Skeeter Books. All rights reserved.